I love this amazing old library table that has been in Hubs family for a couple of generations. 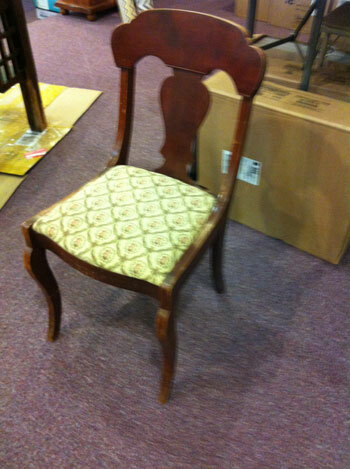 However, the veneer was badly peeling and the dark heavy color did not play nice with the rest of our furniture. 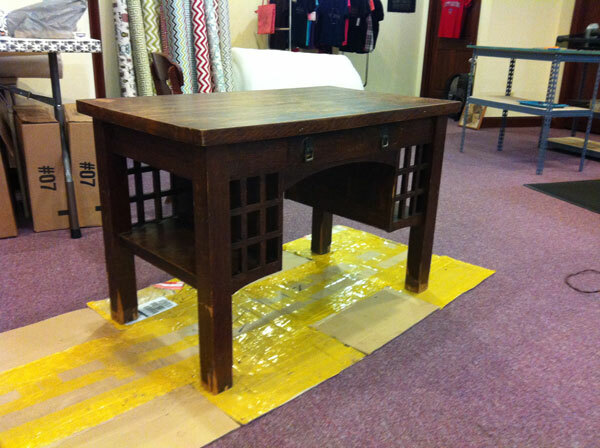 After seeing some of my successful furniture “makeovers,” Hubs decided that he would like for me to paint this piece! Of course, I was not satisfied to simply paint it. 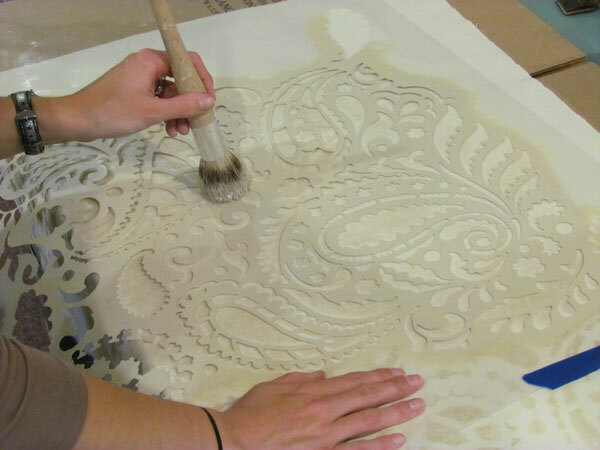 This would be the perfect canvas for our new paisley design stencil that we had just bought! 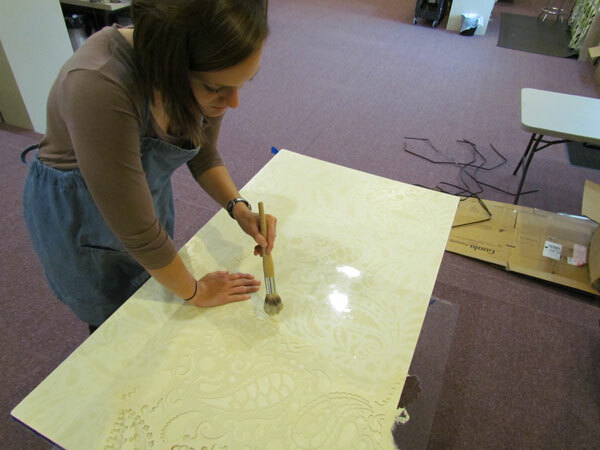 So after a good sanding and a simple creamy color semi-gloss latex base coat, my studio assistant, Amanda, began stenciling this paisley design onto the top of the table. We chose a very subtle light tan color matte latex in hopes of creating a monochromatic design that would be very soft on the eyes. First we taped the side edges of the desk with painters tape to keep any stray paint from getting onto the edges. We chose to use a large soft stencil brush instead of a roller. 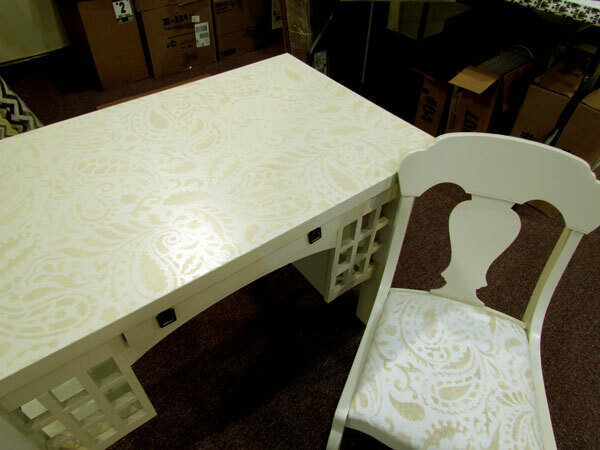 The brush gave us more control over the amount of paint and we wanted this desk to have a soft, shabby effect with the paint more solid in some places and faded in others. Thankfully our stencil is a huge size designed for full wall coverage so we didn’t have to do a lot of repositioning. Amanda found this stencil online at a shop called Cutting Edge Stencils and we were very pleased with the quality. I predict we’ll be ordering more stencils from them in the future. Ta Daa!!! The finished desk! We LOVE the soft subtle scheme although I think we’d also enjoy this design in a more dramatic color combination as well. I think a creamy base with a black stencil could look elegant. 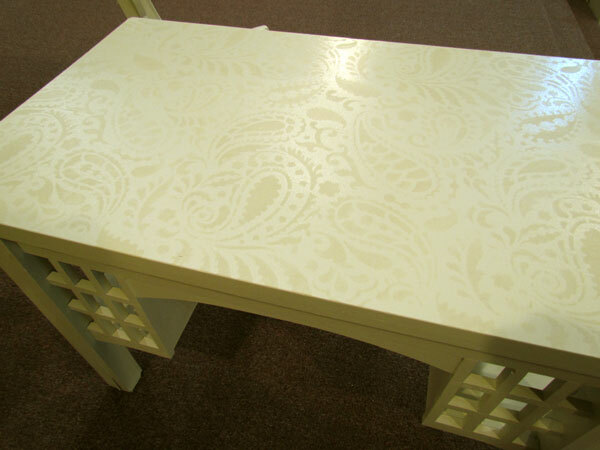 That may be my next project if I can find another surface in need of stenciling. So what’s a desk without a matching chair? A friend of mine sold me this chair from her storage unit and it was the perfect scale and shape to match our desk. Bring out the creamy semi-gloss base coat again! We removed the seat which was secured from the bottom with four screws and painted the entire chair to match the base coat of the desk. With our new Home Decor Pinterest style fabrics, we have so many trendy options for covering the seat but we settled on using our solid Natural Home Decor Canvas Fabric so that we could use our stencil one more time! 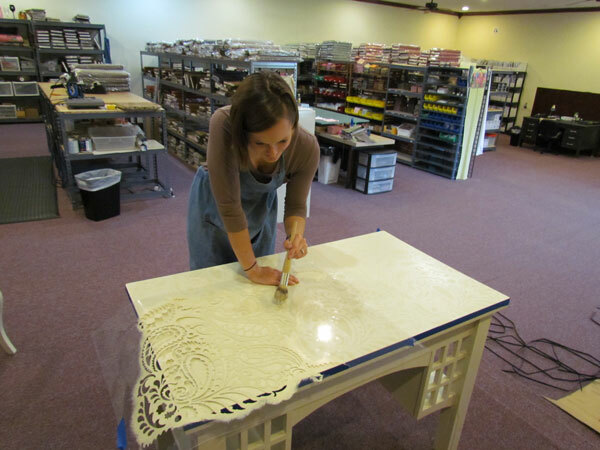 Amanda is shown below stenciling a section of the blank fabric with the same stencil and the same paint color that we used on the desk. 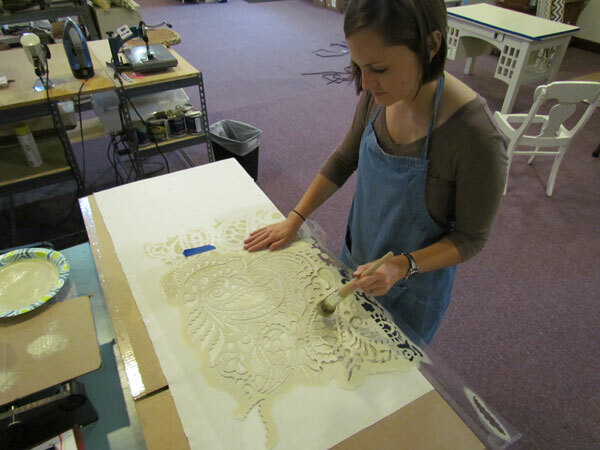 You can use most acrylic or latex paints to stencil fabric as long as you mix in a fabric medium first. Fabric medium is available in the paint aisle at most craft or hobby stores. If I just need a little bit of paint, I love to buy those sample jars from the home improvement store so that I can get just the perfect color mixed up for me. Ta Daa, again! 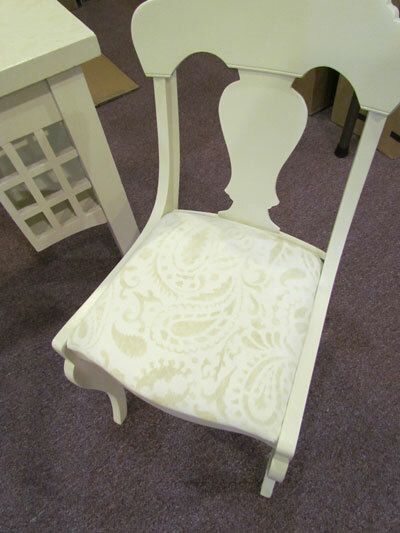 We stapled the newly stenciled fabric onto the seat of the chair and replaced it using the original screws and holes. I can’t wait to move this gorgeous matching desk & chair into my home but for now it’s going to stay here in the Studio for a while so we can all enjoy it. Everyone that stops by is loving the look and wants to borrow our stencil!